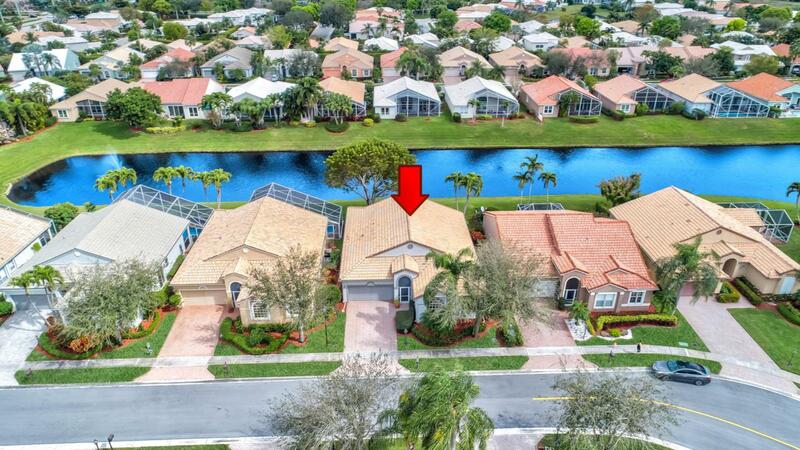 Fabulous one story home in the very popular Costa Del Sol subdivision in Boca Pointe. Views! Views! Views! Amazing long wrap around lake views from inside & outside on the extended pavered patio. Enjoy this tropical paradise on a premium waterfront lot w/manicured landscaping surrounding this very serene back yard & patio area. No neighbors to see in this very private backyard. Great for entertaining! 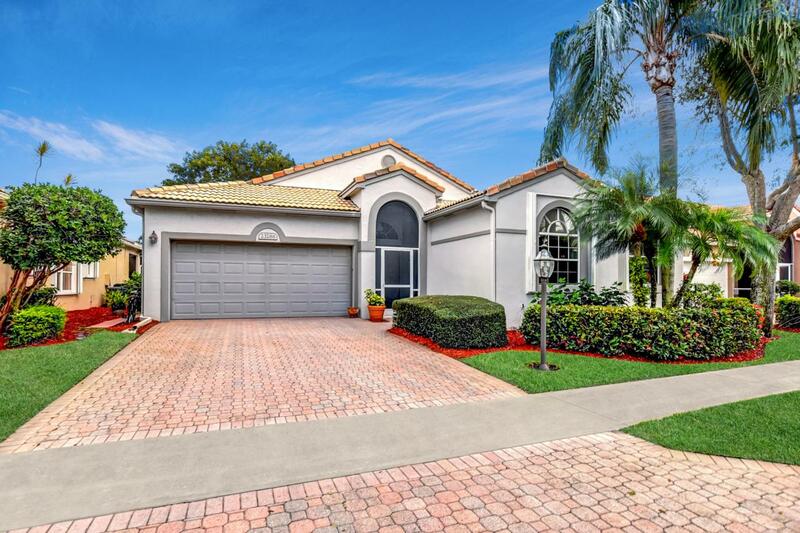 Dramatic entrance w/vaulted ceilings, picturesque windows, crown molding everywhere including the bathrooms, & neutral tile on a diagonal throughout living area and large master suite. Updated kitchen with granite counter tops & backsplash, custom wood cabinets w/pull out drawers, a sunny eat in area & a granite raised snack bar.Kitchen opens to the family room w/tons of recessed lighting & an impact sliding glass door that takes you to the waterfront patio & backyard. This home also Features an open living and dining room, and 2 additional bedrooms that have laminate wood flooring & a larger inside utility/laundry room than others of this model. Impact glass, or accordion shutters for all windows & doors (one storm panel). Newer hurricane garage door from 2006. New A/C. New Hot Water Heater. This home has been lovingly maintained by the original owner. Move in ready. The furniture is negotiable, and this home can also be purchased turn key. This is the Sought after Lennox model, that offers a great floor plan with split bedrooms! Pet friendly community (pets up to 35lbs). All ages. Amazing Schools. 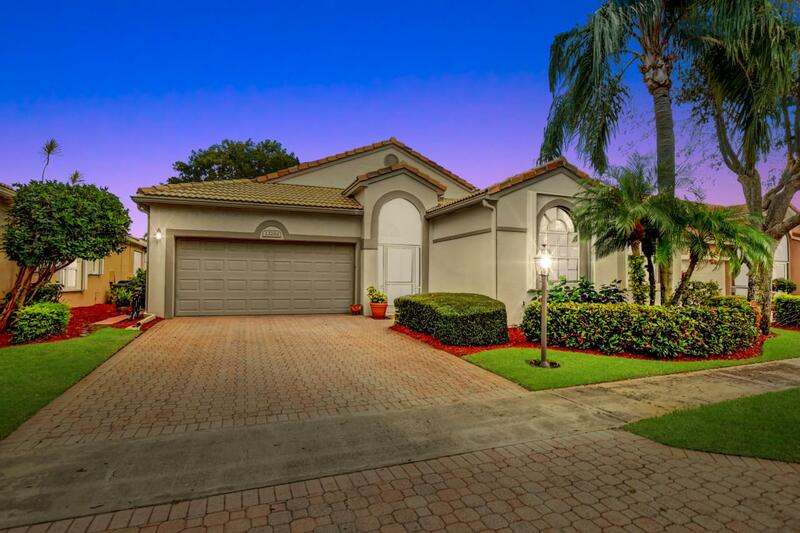 Costa Del Sol is a 24 hour man gated beautiful enclave of single family homes. Featuring a community pool & includes: cutting the grass, cable, complete periodic painting of homes, periodic pressure cleaning of the roofs and walkways, alarm monitoring and more. Boca Pointe Club Membership is Not Mandatory but you have the option of choosing to belong to the Club at Boca Pointe, which includes an 18-hole golf course, upscale dining facilities, complete athletic and recreational facilities & many social programs. The club offers golf, tennis & social memberships, as well as a la carte options. Website: https://www.BocaPointe.com.